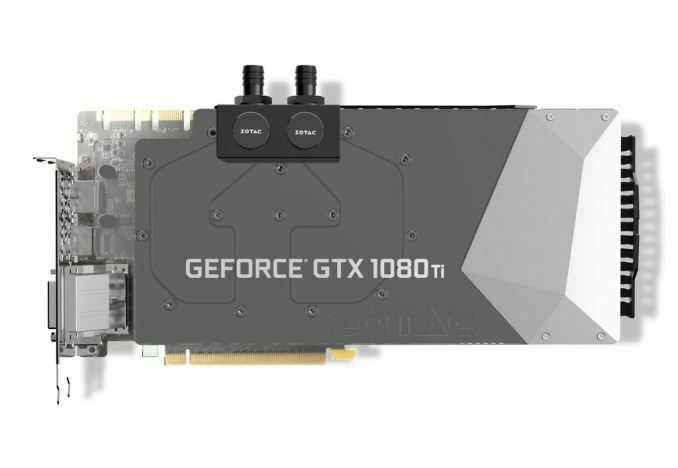 Following what seems to be an industry pattern at the moment, ZOTAC has just announced their very own highly customized and liquid-cooled GeForce GTX 1080 Ti. 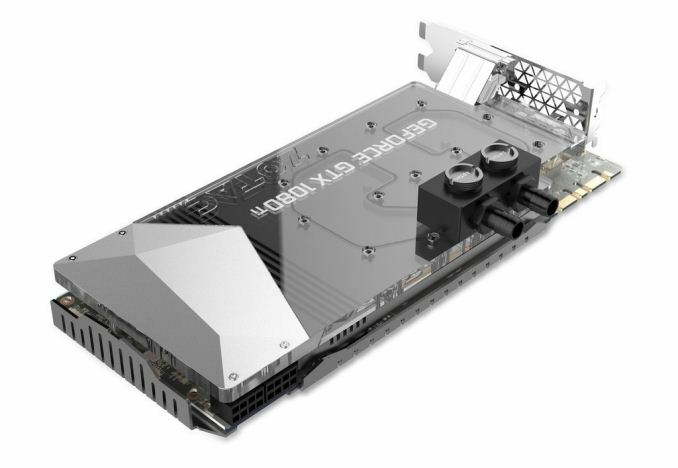 Out of the box, this new GeForce GTX 1080 Ti ArcticStorm model does not appear to be trying to compete for the title of highest-performing graphics card on the market, but it has the prerequisites to be a highly competitive product. Starting off with the basics, the GeForce GTX 1080 Ti ArcticStorm ships with an out of the box core clock of 1506 MHz, a boost clock of 1620 Mhz, and 11GB of GDDR5X memory clocked at 11Gbps. Connectivity is quite good with the video output selection consisting of three DisplayPort 1.4, one dual-link DVI-D, and one HDMI 2.0b. While 1506/1620 MHz (base/boost) is a fairly mild factory overclock for a custom card, ZOTAC have clearly designed this model to be manually overclocked. It has a beefy 16+2-phase VRM, two rear-mounted Power Boost 2.0 capacitors, and dual 8-pin PCIe power connectors. In fact, this new ArcticStorm model shares all the same power components as the ZOTAC GeForce GTX 1080 Ti AMP Extreme Edition, which has much higher factory clock speeds despite being air-cooled. On that model, the default core clock is 1645 MHz, the boost Clock is 1759 Mhz, and even the memory has been pushed up to 11.2 Ghz. The key selling point of this ArcticStorm model is clearly the full-coverage water block. While the primary material is not listed, the top of the water block is made of a translucent acrylic, it has copper contact plate to maximize heat transfer, and 0.3mm micro-channels to increase surface area and cooling performance. The block features G 1/4 threaded fittings to make it compatible with most third-party liquid cooling solutions, and a pair of barbs supporting 10mm ID tubing are included. Since it is the feature of the year, the water block inevitably has built-in RGB LED lightning - which ZOTAC calls Spectra - and it is controlled with the included FireStorm utility. For aesthetic and durability reasons, this model also a metal wraparound backplate. 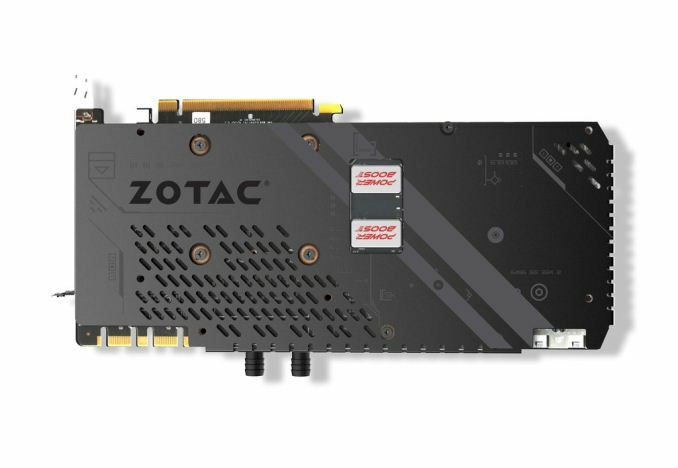 Although there are no details with regard to availability or pricing, we definitely expect the ZOTAC GeForce GTX 1080 Ti ArcticStorm to fall in the $800-900 range.